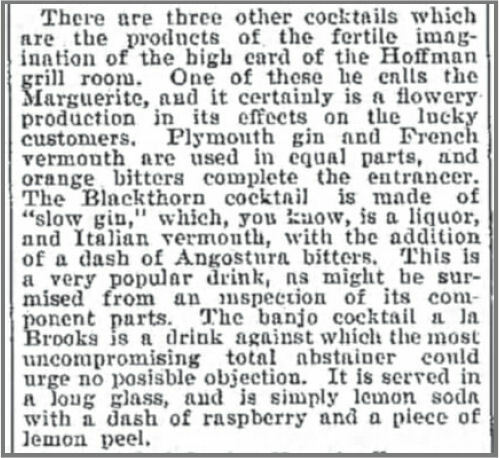 1897 “Dry Martini” Recipe in the New York Herald? Not Quite. 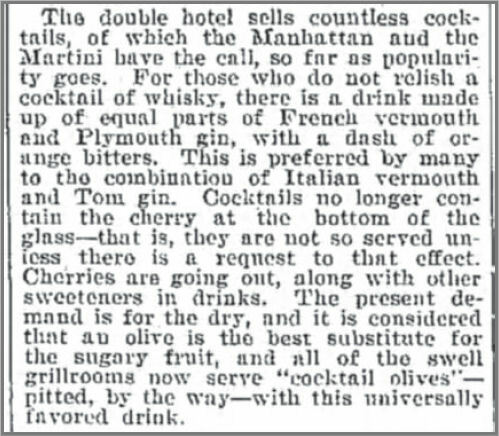 It has been claimed that there is a Dry Martini Cocktail recipe in the New York Herald article “New Things in Tipples” from 1897. Let’s take a look. Here is paragraph seven of that article. There is the same drink again! It is exactly the same drink, made with equal parts Plymouth dry gin and dry ‘French’ vermouth wine with orange bitters! Oh, this time the source gives it a name — the Marguerite Cocktail. Sure, the Marguerite is specified as being served at the Hoffman House where the un-named dry cocktail was being served at the Waldorf-Astoria (where Joseph Taylor worked and seems to have called the same drink the “Dewey Cocktail”). So I wonder why, when an old source gives no name for the drink one seeks in one passage, and another name for it in another passage, why assume that the name you want to call it, but that appears nowhere in the article, is what is being evidenced by the text? It would have been more accurate to say the 1897 source is the oldest one known to describe dry cocktails made with dry gin and dry vermouth wine and orange bitters, that may have been called Dry Martini, but that surely was called something else.